Wire (up to 1.4 mm for toroids, up to 2 mm for air coils, 14ft or 4.3m in length). You can buy magnet wires on eBay, Amazon or in US at this link and this link, in Europe at this link. Below is a schematics from a software package. It created with 20M band leg shown twice. Please, do not be confused by this. You can see that some LC trap frequencies is off the particular band. You can move it inside. 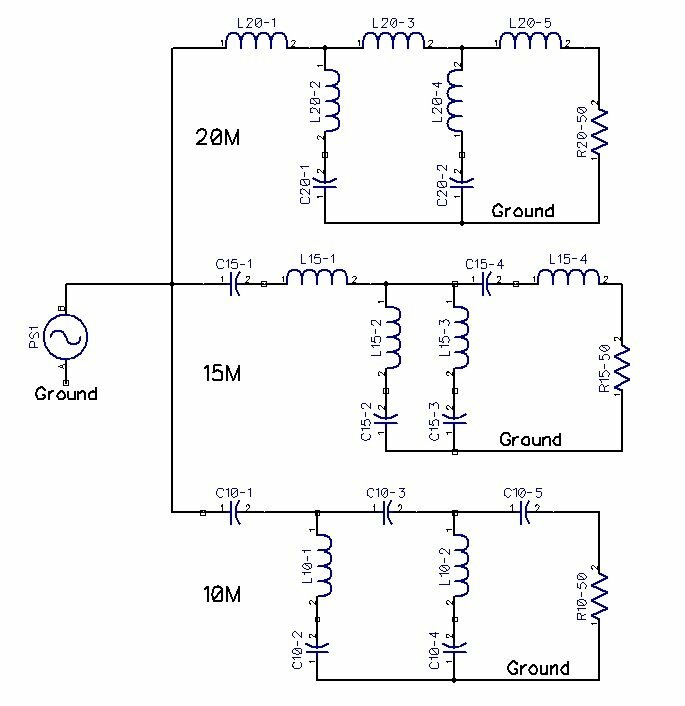 Please, read Assembly Instruction page to see how LC trap frequencies influence the triplexer. Please, see an example of a Caps_Set_Values you can use in parallel. TDK high voltage low-dissipation capacitors, type CC45. Use high quality ceramic or Silver Mica capacitors in parallel. Wire diameter can be between 1.2 to 1.4 mm for toroids, and no more than 2.1 mm for air coils. The board has 1.5 mm and 2.2 mm holes respectively. Spread/compress turns to decrease/increase toroid inductance. For this type of cores you can change inductance as much as 30%. Do not make core turns very tight as it will be difficult to spread/compress it for tuning. Use a reasonable force that would keep turns steady but not loose. You can glue toroids to the board, but do not use any glue to keep turns steady, the glue degrades Q factor and you can expect triplexer numbers gets lower. Of course, you can experiment how it would work for you. L20-5 and L15-4 air coil are quite sensitive to how you mount your board inside enclosure. 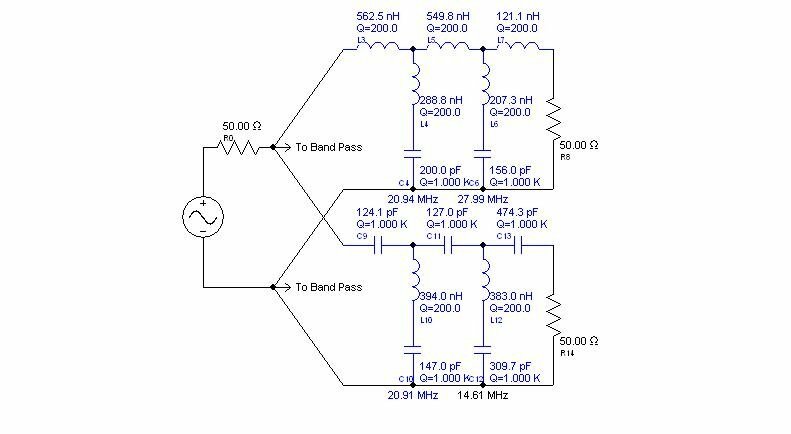 Because of small inductance of each coil the wire between a triplexer board and an enclosure UHF connector is a significant part of the coil. The right way to count wire turns is to do it inside the toroid. As soon as wire goes through the toroid this is a turn.